By around 7000 BC there started to be more people in Greece. It became harder and harder to get all the food you needed just by gathering and hunting. So people began to farm. Farming was more work (and not as much fun as picking wild berries and nuts), and the food you got wasn’t as good for you and was pretty boring, but you could feed more people on less land. 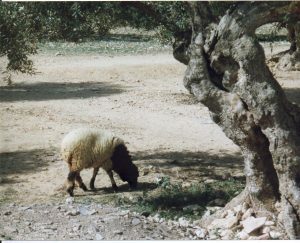 People also began to herd sheep and goats and pigs. By 5800 BC, there were small villages in Greece. At Nea Nikomedia, people lived in small houses made of sticks and mud (wattle and daub). They had started to use pottery (clay pots). Probably they learned how to make pots from people from West Asia. But as soon as people settled down, they also began to have to defend their villages and fields against invaders. Nea Nikomedia was surrounded by a wooden fence and two ditches. At a nearby village, Makriyalos, people threw dead people into their ditches and just left them there unburied – maybe because of a war. By around 5000 BC people began having stone foundations for their houses, and stone walls around their villages, with complicated gates to make it hard to fight your way in. They probably fought with spears, maces, slings, and bows and arrows. Their fanciest pottery (dishes, pitchers, cups) was decorated with red and white patterns, and some of it was carried to other villages and sold there. The best dishes and cups came from a village called Sesklo. 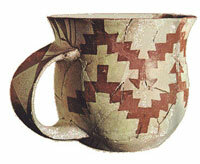 Other villages imitated the Sesklo cups, but not as well. Probably around this time the Greek villages got big enough to choose a “big man” or “headman” to organize the village and settle arguments, and lead the men to war. Around 4000 BC a big fire destroyed the village of Sesklo. The fire could have been an accident – when people use fires to cook on inside, thatched houses do catch fire. Or it might have been a war. Late Neolithic villages like the one at Dimini may have had more inequality than before, and more wars. They had one big house in the center of the village, and also had several stone walls around it with tricky gates. Around the same time, Nea Nikomedia and Sesklo also got one big house in the center of the village. Probably people were beginning to rule these villages by inheriting power from their parents, as chiefs. 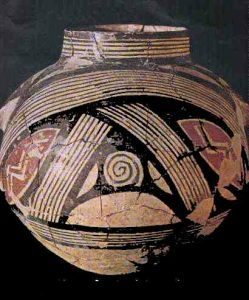 This is the kind of pottery people used in Dimini in the last part of the Stone Age, around 3000 BC. The Stone Age: What Life Was Like for the Earliest Humans, by Philip Steele (2000). Includes instructions for projects. Eyewitness: Early Humans, by Nick Merriman (2000). Ages 9-12, with great pictures. The Archaeology of Greece: An Introduction, by William Biers (revised edition 1996)Biers writes very clearly and has a lot of good pictures. The Early Neolithic in Greece : The First Farming Communities in Europe (Cambridge World Archaeology), by Catherine Perlès and Norman Yoffee(Editor) (2001). Cite this page: Carr, K.E. Neolithic Greece – the Late Stone Age. Quatr.us Study Guides, July 8, 2017. Web. April 18, 2019.